Japan’s top stars Yuzuru Hanyu and Shoma Uno kept their team in the lead as the 2017 ISU World Team Trophy continued Friday in Tokyo. Team Japan has accumulated 81 points so far. Team USA pulled up to second place with 78 points, overtaking Team Russia who now has 74 points. Team Canada is now fourth (67 points) followed by China (59 points) and France (46 points). Vanessa James and Morgan Cipres of France perform their Short Program at the 2017 World Team Trophy. The Pairs event opened today’s competition with their Short Program and there was a big surprise when top favorites Evgenia Tarasova and Vladimir Morozov of Russia failed to deliver. Her falls on the side by side triple toe and the throw triple loop left the World bronze medalists in fourth place at 66.37 points. They added only nine points to the team score. “These were technical errors on my side more than a result of being tired at the end of the season,” Tarasova admitted. She added that she does not feel affected anymore by her injury sustained at Worlds when she cut her leg in a practice accident and received ten stitches. France’s Vanessa James and Morgan Cipres came out to take the Pairs Short with a strong performance to “Earned it” by The Weeknd that included a solid side by side triple Salchow and throw triple flip. The European bronze medalists set a new personal best with 75.72 points for themselves. Cheng Peng and Yang Jin of China secured 11 points for their team by coming in second. The ISU Grand Prix Finalists turned in a clean program with a triple toe and throw triple loop as well and entertained the crowd with their fun interpretation of “My Drag” (71.36 points). Kirsten Moore-Towers and Michael Marinaro of Canada placed third with another clean performance (69.56 points). Ashley Cain and Timothy LeDuc (USA) were fifth after a messy triple twist and an underrotated side by side triple loop (59.57 points). Sumire Suto and Francis Boudreau-Audet came sixth. She fell on a downgraded triple Salchow and also stepped out of the landing of the throw triple Salchow (54.84 points). Kaitlyn Weaver and Andrew Poje of Canada perform their Free Dance at the 2017 World Team Trophy. In Ice Dance, Canadians Kaitlyn Weaver and Andrew Poje put out a passionate and flawless performance to “En Aranjuez, con tu amor” and collected a level four for their spectacular lifts, the combination spin, twizzles and diagonal step sequence while the circular footwork was rated a level three. The Canadians posted a new personal best with 113.83 points and won the Free Dance. USA’s Madison Chock and Evan Bates had to overcome a stumble in the serpentine footwork early into their program to “Under Pressure” by David Bowie and Freddie Mercury, but went on as if nothing had happened and produced six level-four elements. The two-time World medalists placed second at 109.96 points. Ekaterina Bobrova and Dmitri Soloviev turned in a solid dance to a Chopin Prelude and a modern version of the Four Seasons, but their step sequences and the combination spin merited a level three and the 2017 European bronze medalists came third just as they did in the Short Dance (104.55 points). Shiyue Wang and Xinyu Liu of China finished fourth with a nice performance to “New York, New York” (94.33 points) followed by Marie-Jade Lauriault/Romain Le Gac (FRA, 92.92 points) and Kana Muramoto/Chris Reed (JPN, 92.68 points). Yuzuru Hanyu of Japan performs his Free Skate at the 2017 World Team Trophy. 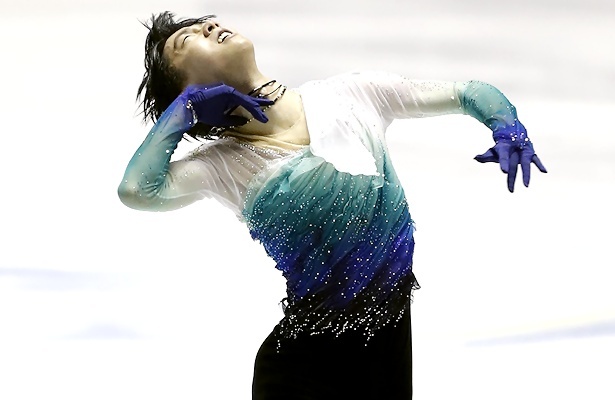 Japan’s main force were again the men and Yuzuru Hanyu successfully looked for redemption after a sub-par short program. The Olympic champion went for five quads in his program to “Hope and Legacy” and landed four – the loop, a quad Salchow-triple toe, a quad toe and quad toe-half loop-triple Salchow. However, he popped a Salchow and at the end, also an Axel. However, the other jumps looked effortless and he also impressed with his flow over the ice to score 200.49 points. Uno opened his Tango routine with a solid quad loop, but the quad flip was shaky and the Lutz received an edge call. Other highlights of the program were the triple Axel-triple toe and a quad toe, but he fell on the second quad flip that was downgraded. Again he was over-scored compared to Hanyu, especially in the program components (198.49 points). Patrick Chan came back from an error-ridden short, and for the first time, nailed three quads in the program – two toes and the Salchow. The only major glitch in his beautiful performance to “A Journey” (composed by pair skater Eric Radford) was a single Axel. Nathan Chen’s (USA) program was highlighted by a quad flip-double toe, a nice quad toe-double toe-double loop and a solo quad toe, only the second flip was wobbly. The Four Continents champion earned 185.24 points. The 17-year-old enjoyed his debut at the Team Trophy. Russian champion Mikhail Kolayda fell on his opening quad Lutz, but nailed everything after that including a quad toe and two triple Axels (184.04 points). USA’s Jason Brown did not try a quad in his exquisite program to The Piano, but went for a clean skate with all triples. He landed everything, but then singled the loop and finished sixth (179.35 points). China’s Boyang Jin doubled his Lutz and stumbled on several other jumps to place seventh (174.63 points).